Lion’s Head Casserole is a great way to have your meat and veggies made in one dish that saves well and reheats well. I recommend this as one of those staple dishes you learn. Get a rice cooker and you’re set. 1. Clean napa cabbage and cut into 1.5″ segments. Separate into 2 piles: stem pieces and leafy pieces. Set aside. 2. 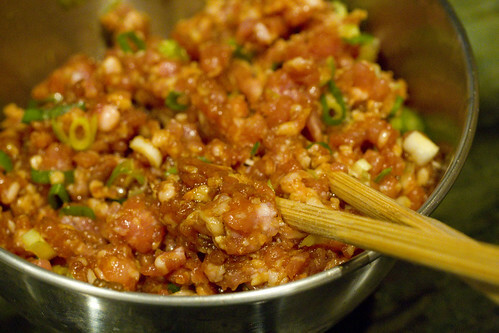 Combine pork, soy sauce, and scallions in a small bowl. Add 6 tablespoons water, cornstarch, sugar, and salt. Stir. 3. Mix in egg white and beat until sticky and well combined. Set aside. 4. Heat oil in a wok or wide pan (at least 4″ high sides) on medium high heat. 5. 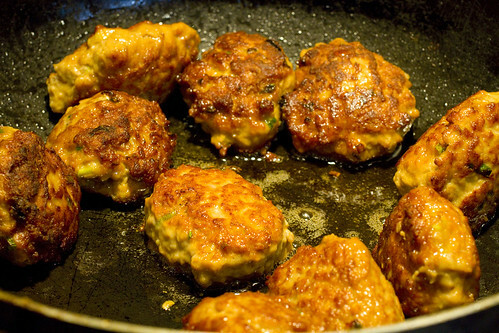 Wet your hands to form 1.5″ meatballs and place in the oil. Turn and brown them on all sides, cooking about half-way through. 6. Dump out the excess oil in the pan, leaving just about 2 teaspoons in the pan. Turn the heat up to high and add the stem pieces of napa cabbage. Flip around with the meatballs. Add 1 cup of water. Cover and cook for 5 minutes, or until stem pieces have softened. 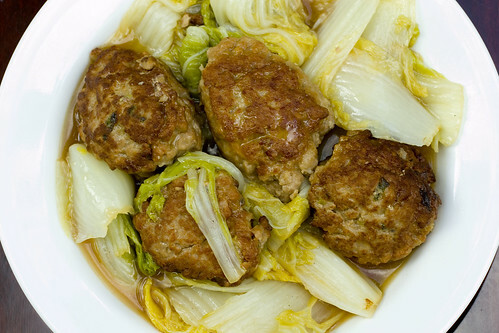 *As you cook, you may need to adjust the amount of water added because each napa cabbage will release a different amount of water. 7. Add the leafy pieces and stir. Cover and cook for 5 minutes. Lower the heat and cook until ready, about 5 minutes. Check that the cabbage is tender and there should be some sauce but not soupy. Serve with rice. *Left-overs can be saved in an airtight container in the fridge for about a week. Reheat in the microwave or stove-top. posted by jessica	at 09:38 AM	Filed under Chinese, Recipes. You can follow any responses to this entry through the RSS 2.0 feed. Both comments and pings are currently closed. YUM! These look so good I want to lick the screen! I have been on a meatball roll lately and although most have had the Italian accent, this dish will fit right in as my next meatball venture. I’ve been making meatballs without red sauces, and they are being well received. 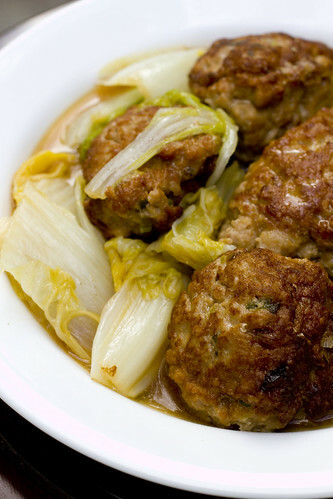 I grew up not eating pork, but even so Lionshead meatballs are also my go-to comfort food. Chinese cook book. We both got hooked on that dish. I sometimes use regular cabbage, sometimes Napa, and have even used a combination. Regular cabbage stands up better than Napa in my view, but has a much different flavor. Marie prefers Napa as she is somewhat allergic to the regular cabbage. Congrats, Jessica. To your mother as well!! Janice, do you eat pork now or do you make an alternative version? Old Doug in BC, I’ve never heard of a cabbage allergy. There are so many related vegetables. Is Marie allergic to broccoli and cauliflower? Thank goodness for your recipes cuz Steve’s mom doesn’t follow any recipes either and isn’t good at measuring things out in such a way that I can ever write down her measurements! 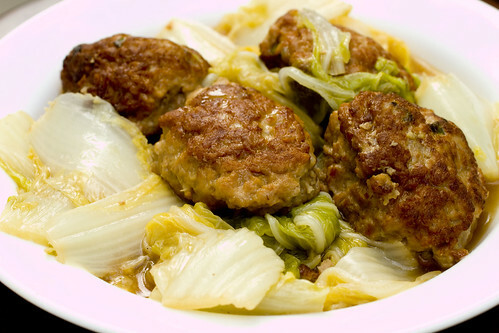 My two added cents are (1) the meatballs freeze well, so it’s great to make up a batch and freeze some for a quick future meal, and (2) one of my favorite parts of the dish is to add rice vermicelli noodles…The meat, cabbage, and noodles altogether hit the spot! Aren’t these so fun to make? I sometimes make 1 giant braised meatball, as they do in Taiwan. If you braise it long enough it just falls apart, like pork shoulder. I’m curious…you said adding tofu as a filler would make the dish sour if not eaten in a day. Would this also apply to potstickers? I have a recipe I want to try that uses tofu in the pork mixture because it would make the pork filling more tender. I planned to freeze what I didn’t eat and then take out only what would be eaten from that point on. Thanks for your input! Delicious sounding recipe – have never tried Lion’s Head casserole before. Dianna, if you freeze the un-cooked potstickers and cook as needed, it should be fine. Don’t cook them and then freeze them. I made these last night and reheated tonight. Great dish and I will definitely make it again! I added a little ginger since I am in cold prevention mode. Thanks Betsy! Hope you stay cold free!! We love meatballs here too and I’m always looking for new ways and here you are! Thank you! This is going on next week’s menu!